Our comprehensive transportation services for freight, full truckload, ocean, air, and more provide valuable options for your shipments. Our process starts by asking detailed questions to get to know your unique needs first hand. Then, we’ll coordinate a seamless shipping process, which will not only make you look brilliant, but save you money. We offer smarter freight services that give you the benefits of custom-made shipping at a feasible price. Our freight experts have an eye for detail and deep connections with our carrier partners, so no matter the size of your shipment, we’ll deliver. Our process starts by identifying your shipment’s freight class. 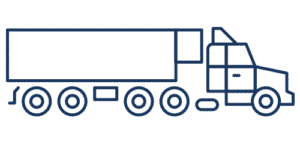 There are 18 different freight classes, based on weight, density, and fragility, that determine the price of your shipment. For example, dense items such as steel and machinery fall into a lower freight class and cost less to ship than fragile or bulky items. Try our Density and Freight Class Calculator to estimate the class of your delivery. Our transportation team knows the ins and outs of the truckload process, which gives our customers a real financial edge. We work closely with our nationwide network of carriers to roadmap your future growth on our BlueShip® technology system. We partner with thousands of dry van freight carriers across the nation. Our flatbed freight reps work around the clock to ensure on time pick-ups and deliveries. Feel confident that your perishable goods will stay safe during delivery with our reliable temperature control system. Do you value having full visibility of your shipments? BlueGrace® customers get the advantage of proactive monitoring and live status updates at their fingertips. All of our services can be viewed in multiple modes, formatted for your personal preference. We also offer inexpensive expedited freight shipping services to our customers in the US and Canada. Whether you’re shipping across wavy oceans or the wide-open sky, our BlueGrace® experts are here to help keep the communication clear, the costs low, and your expectations high. We take any kind of freight anywhere. Our international advisors are specialists in providing customers with simple and seamless overseas management. They’ll provide everything you need for ocean or air transactions, from customs clearance assistance to easy access of important documentation. We partner with the leading rail and intermodal carriers in the US to bring the most valuable options for customers. This option is beneficial for shippers who want low cost and can ship in lengthier transit times. Our international air cargo partners move freight all over the world with their own fleet of trucks for door-to-door shipments. We provide customers with great rates on international airfreight shipping and full visibility of their international shipments from origin to destination.